I always return to Ny Carlsberg Glyptotek when I visit Copenhagen. This was one of the sights on schedule as Ketil and I visited the Danish capital. We wanted to pay homage to Sekhmet, the Lion Goddess, and standing in front of her was a powerful experience. The Egyptian collection offers some real treasures. Dating back thousands of years. Entering the rooms you are faced with pharaohs, sphinxes and other mythical creatures whose meaning has been lost in time. I have always been intrigued by Egypt, from the first time time I heard about Tutankhamun's treasure and the other hidden graves in the Valley of Kings. That was one of the reasons why I decided to study archeology. The Egyptians adorned their statues and buildings with their hieroglyphs, and since Champollion read this early writing for the first time in 1822 we actually know a lot about the world in which the Egyptians lived. This is a close up of a hieroglyphs found on a large stone portal framing one of the doors at Ny Carlsberg Glyptotek. I wonder what it means? Meet Sekhmet - the Lion Goddess. She used to be the Warrior Goddess of Upper Egypt, and the protector of the Egyptian Pharaohs. She is made in diorite, an extremely hard rock, very difficult to work with. In fact diorite tools were in ancient Egypt used to cut granite. 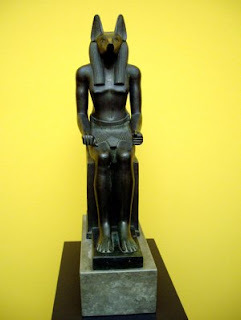 It dates back to the reign of Amenhotep III (1391-1353 BC). 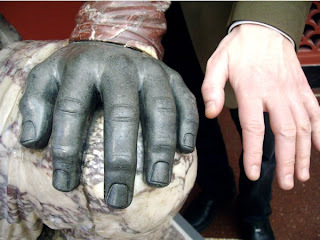 There are no records on where the statue was found or originates from. 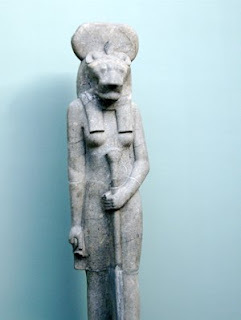 This magnificent statue is much younger than Sekhmet. 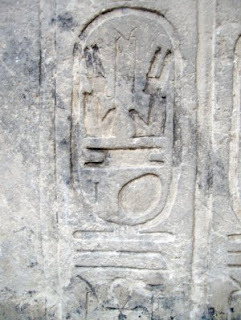 It depicts Anubis, or Inpu, Anupu, Wip, or Ienpw. This God with a Jackal head was supposed to lead you to the afterlife. He was God of embalming, the old practice the Egyptians used to mummify their dead and prepare them for the afterlife. He was in the oldest Egyptian texts associated with the burial of the king. It is made from bronze and dates probably to the 26th dynasty (664-525 BC). In this period Egypt was ruled by client Kings installed by the powerful Assyrians.